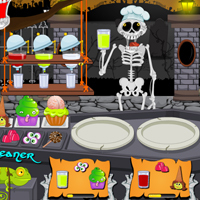 Hallowen Graveyard Restaurant info about the game-Games2Rule. Do you ever imagine how a graveyard restaurant will be? Here is the answer for you. A skeleton is running a food court in a graveyard. Lots of customers started coming to your restaurant. Give the customers their desired scary food, do not make them wait for long time, waiting time will be indicated, serve them before that or they will leave the restaurant. The number of scary food will increase in the subsequent levels, and limit will also increase. Good Luck and Have a scary food!